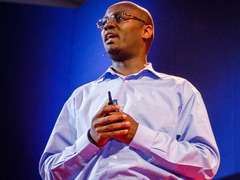 Andrew Mwenda: Aid for Africa? No thanks. In 2007, journalist Andrew Mwenda took the stage at TEDGlobal in Arusha, Tanzania, and decried the symptomatic disease affecting his home continent: aid. The surprising take certainly got the goat of some members of the audience, including U2 frontman Bono, who has devoted so much time to promoting the need for African aid and who spoke up from the audience as Mwenda was talking. Mwenda, however, stood his ground, and still does so today, working as the strategy and editorial director at Independent Publications, where he uses The Independent to urge his audience to look afresh at the state of Africa. We caught up with him over email to find out what he’s been up to in the years since the talk; an edited version of the conversation follows. What are the most important things you want someone seeing your TED Talk to know now? That Africa cannot be developed through charity channeled through governments but by trade and private investments by the private sector. That most international media coverage tends to purvey prejudice rather than convey news. You have been arrested multiple times for your work. Just last month, the Daily Monitor was closed. What is the current status of press freedom in Uganda? Yes, I have been arrested several times for my work. By 2010, I had 24 criminal charges against me in Ugandan courts. I launched a successful challenge of some of the draconian laws, and two of them were struck down by the constitutional court. Today, the number of criminal charges I am facing in courts of law in Uganda is 12. In your TED Talk, you passionately called for the Africa story to be reframed from one focused on poverty, despair and aid. Do you feel this has this happened in the ensuing years? Yes, there is increasing recognition that Africa has successful stories to tell, as evidenced in a recent “Africa Rising” cover of The Economist, and the programs “African Voices” and “Market Place Africa” on CNN. The other western media are increasingly telling positive stories about Africa — especially about innovations in mobile telephony and sustained economic growth. Has the system of supporting entrepreneurs and funding innovation changed or improved in Africa in the past five years? If so, how? There is increasing interest in Africa, but it is still too early to say that we are seeing massive transfer of funds to finance innovation. However, FDI [foreign direct investment] to Africa and trade between Africa and other parts of the world, especially China and India, has grown by leaps and bounds since 2007. Tell us about your company. What does it do and what are your ultimate goals? We are a media company that publishes The Independent — a magazine like Time or a newspaper but better than them. It is weekly; we circulate in Rwanda, Kenya, Uganda and South Sudan. We also publish special series of our magazine focusing on particular sectors that are succeeding in creating economic opportunities for millions. You were nominated a Young Global Leader at the World Economic Forum. Is there any danger that the establishment you object to is in fact assimilating you? Of course, the danger is always there. And on occasion, it succeeds. However, the best way to mitigate the tendency towards co-optation is to be aware of it so that whatever you do, you have at the back of your mind that you risk being co-opted (you use the word “assimilated.”) The point, however, is that one has to sometimes work with the establishment to achieve shared goals and oppose it when it is necessary. The real danger is not co-optation by the system but becoming too rigid and fanatical in one’s opposition to the establishment that one loses sight of the many positive aspects of cooperation. I learned from Nelson Mandela that one can work with opponents in a principled way around a shared objective without getting compromised. You have described politics as “a dumping ground for mediocrity.” Clearly that’s not just a problem in Uganda. But what do you think is the solution? Do you see change happening any time soon? Change is always slow in coming — and when it comes, it does not always follow a simple linear progression. Look at Egypt and all the upheaval it is going through today. Many people expected the democratization process to go smoothly. But reality is rarely like that. I am optimistic because I can see Africa is rapidly changing — a new and more vibrant and educated youthful population is taking charge. i appreciate you andrew and the work your doing,i think as the young generation we need informed men like andrew to mentor us,and let us listern,obey and act?